A LEADING wildlife charity have teamed up with a Byfleet church to unveil a garden of biblical proportions in the village. Surrey Wildlife Trust are marking Cherishing Churchyards Week (June 9 to 15) by opening the Contemplative Garden in St Mary’s Churchyard. The organisation are also asking members of the public to get involved and discover the wonderful array of wildlife that churchyards contain. Churches and churchyards are often an important refuge for rare and protected species such as bats and slow worms. Many contain rare plants, relics of the old meadows that once surrounded the church. 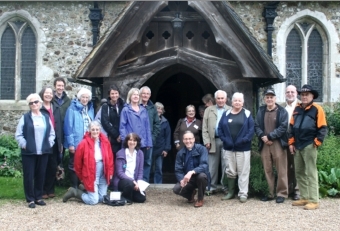 On May 24, a total of 31 delegates from 11 churches and parishes across Surrey came together for a networking event on Living Churchyards at St Mary’s. Attendees heard talks on several aspects of churchyard management from wildlife and community engagement to managing regulations. The talks were followed by workshops and a networking lunch. In the afternoon there was a chance to walk around the churchyard and see the new Contemplative Garden and wildflower areas. Everyone agreed it was a very useful day with calls from attendees to make the event an annual one. At midday on Sunday, June 15 the Bishop of Guildford will be officially opening the Byfleet garden. It has taken 18 months to transform the neglected space into a quiet reflective space that is enjoyed by all. Much of the work has been done by local volunteers from ‘The Wild Bunch’ (a new group member of the trust), with support from parishioners, Byfleet Brownies and local residents. Funding for the project was gratefully received from Surrey County Council.